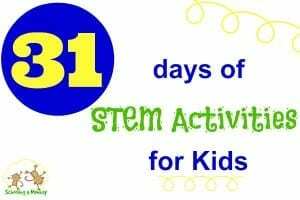 Welcome to the 31 Days of STEM Activities for Kids series! Today, our post is about Technology. Go here to see the other posts in the series! Monkey has loved Minecraft far longer than it has been explosive in popularity. I think we all started playing Minecraft together in 2011 or 2012, when Monkey was about 5 or 6. We all have a lot of Minecraft experience under our belts! 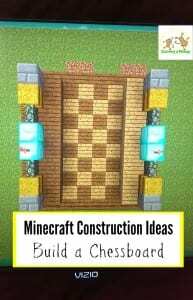 I love the potential that Minecraft construction offers for creative play, engineering skills, and even basic computer programming. When you start dealing with levers, redstone, and the other more complicated elements in Minecraft you can create some surprisingly sophisticated programs. However, Monkey doesn’t often build such elaborate structures. Right now, her favorite Minecraft construction technique is to re-create the animals in block form. She comes up with some fairly elaborate and detailed animals that way! But when I asked her to create a Minecraft construction tutorial, she said she wanted to build a Minecraft chessboard. So that is what we did! If you want to make your own Minecraft Chessboard, here are Monkey’s instructions. Build this chessboard while in creative mode and it will be much easier. Make an 8X8 block base alternating between jungle wood and oak wood blocks. This creates the base of the chessboard. Cover two rows of the board with jungle wood blocks and on the opposite side with oak blocks. 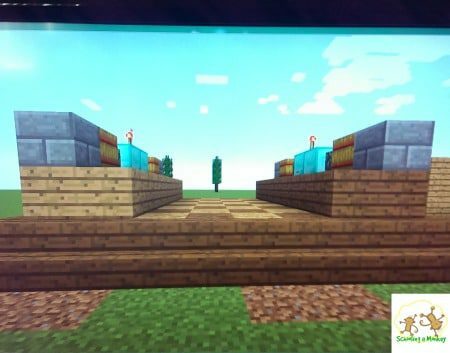 On the very back row, use diamond blocks for the king and queen (use the torch to identify the queen), the stone wall for the bishops, the hay bales for the knights (because horses eat hay, naturally), and the stone blocks for the rooks. Add a border of jungle wood stairs around the entire perimeter of the chessboard to make it easier to walk on. Your Minecraft construction chessboard is complete! 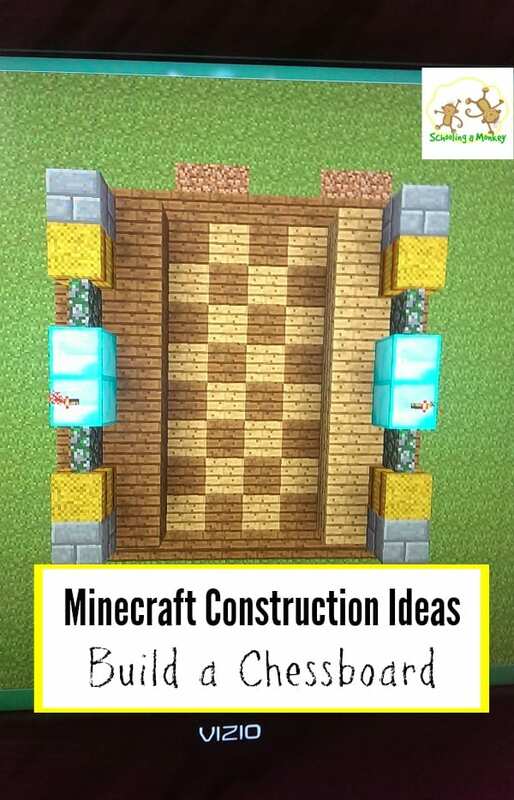 Do your kids build structures in Minecraft? What do they love making? Want more STEM? Find the rest of the 31 days of STEM activities for kids posts here! Get more homeschooling tips for moms in the full 31 days of homeschooling tips for moms series!